For MS Dhoni, criticisms and praises do not quite fluster him as he takes them both in his stride. 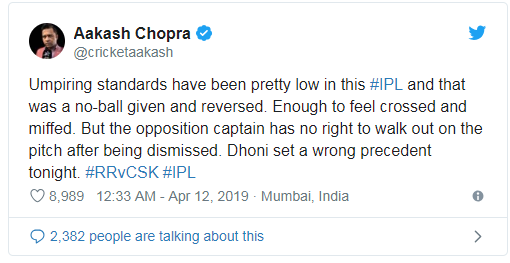 But when he walked out on to the field from the dugout to argue with the umpires, it was an uncharacteristic burst from the Chennai Super Kings skipper. “He was certainly fired up the way the decision was handled and why it was overturned. It was a lack of clarity, obviously from him and he wanted to get it clarified at a key moment,” Fleming said in the post-match presentation. However, this has not gone down well with the match officials and the skipper has now been slapped with a 50 per cent fine of his match fees. The CSK skipper lauded Rajasthan Royals for being brilliant with the ball and in the field despite posting a par score on the pitch. CSK lost four wickets in the powerplay overs when Dhoni and Rayudu strung an important partnership to bail them out of trouble. “It was a very good game. Need to give credit to Rajasthan. They were slightly few runs short on what would’ve been a good score. But they put pressure on our batsmen and they were able to build pressure right to the end. Once you win games like this, you learn a lot out of it. It’s important to enjoy the win but also learn from the mistakes,” Dhoni said. Rajasthan skipper Ajinkya Rahane too praised the efforts of his bowlers and fielders for putting CSK under the pump despite a below-par score on the board. Also, despite results not going his way, Rahane said that he was enjoying the role and taking every game one step at a time. “I don’t think so (when asked if he’d have done anything differently). Credit to our bowlers, on that wicket I thought 150 was low. We should have batted better, on that wicket 170 would have been very good. We feel disappointed. It was about having the belief,” Rahane said. Chennai Super Kings managed to get home courtesy a last ball six by Mitchell Santner as Dhoni’s side extended their lead at the top of the points table. Despite the result, former cricketers took to Twitter and criticised the skipper for behaving in such a way and even called the behaviour to be way out of line.